Dr. Shirin Salehinia works closely with her patients at both the San Leandro and Castro Valley, California offices of Creative Dimensions in Dentistry to understand their needs and provide a personalized service in a comfortable setting. She has years of experience in delivering smooth procedures, including teeth whitening, veneers, root canals, dental implants, and dental crowns and bridges to create beautiful and healthy smiles. Dr. Salehinia received her doctor of dental surgery degree from the University of California San Francisco (UCSF) School of Dentistry and completed a residency program in dental sleep medicine at Tufts University. She has also been a faculty member at the University of Pacific Dugoni School of Dentistry since 1997 as a clinical and pre-clinical instructor of restorative dentistry. She is a member of the American Dental Association, California Dental Association, Southern Alameda County Dental Society and the American Academy of Dental Sleep Medicine. 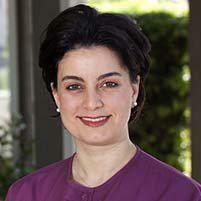 Dr. Salehinia believes a person’s oral health is related to their overall health and well-being. She helps her patients learn how their lifestyles relate to their oral health, and how their oral health results in a healthier body and a happier life.